I like attending the Powell St. Festival. Somewhere in my clothes drawer I have a t-shirt from the 10th Anniversary festival back in 1986. Check out the Powell Street Festival on Saturday and Sunday. 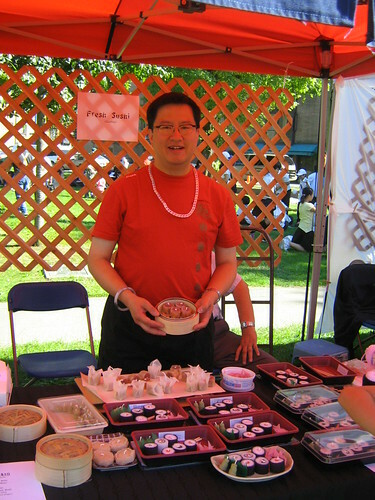 This entry was posted in Asian Canadian Cultural Events, Cultural Fusion, Food & Restaurants, Hapa culture, Main Page, Multicultural events, Music, Upcoming Events, Vancouver Area Adventures on July 31, 2009 by Todd. Certain parts of Japanese culture export very well. Sushi and anime are so popular in the West that they have a life of their own that is separate from their Japanese origins. This is wonderful, but it may leave a somewhat distorted image of Japanese culture as a whole. Japan is much more than raw fish and giant robots! Judging by the audience at the Koto Concert put on by the National Nikkei Museum and Heritage Centre, the koto, Japan’s national musical instrument, still has a long way to go before it penetrates Vancouver’s cultural consciousness — nearly all of the crowd was of Japanese origin, with the odd Japanese-by-marriage family member and a few curious seniors mixed in. If only everyone was so curious! The concert, which featured professional koto player Chikako Kanehisa and shakuhachi master Mitsuhashi Kifu, was presented as part of the 80th anniversary of Japanese-Canadian relations that also brought the Emperor of Japan to Vancouver earlier this month. Those fortunate (or curious) enough to attend got to see a part of Japanese culture that is barely visible in the West. Certainly, I had never heard of the koto before the concert, but the sound is familiar. Anyone with a passing interest in Asian cultures has probably heard a koto — or one of its relatives — without knowing what it was. It’s not an easy instrument to describe; it resembles a huge, six-foot long zither with thirteen movable bridges. The strings are plucked (or strummed, or thumped, or rubbed) with the right hand on one side of the bridge while the left hand is used to create pitch shifts or vibrato on the other side of the bridge. Listening to it was a complex experience — it’s the kind of music that would be impossible to put in writing because there are so many intangible aspects that aren’t captured by quarter notes on a staff. It had a very organic feel, like listening to birdsong. Ironically, the song entitled “Like a bird” (鳥のように) was one of the least like this, it carried a more regular rhythm and more clearly defined pitches than some of the others. Perhaps because of this, it was one of the more accessible, exciting songs to my Western ear, but I couldn’t help but feel that the beauty of the instrument was captured best in some of the other songs — the ones with slightly bent pitches and somewhat irregular rhythms. The (Japanese?) idea that beauty is inherent in small, slight imperfections is one that has always resonated with me, and the Koto struck me as an instrument where the skill in playing came from creating just the right pattern of imperfections. The shakuhachi flute is an instrument that I am more familiar with, but it too impressed me with the range of sounds it could produce. Like the koto, many of the notes were bent in a way that seems more reminiscent of a saxophone or a trumpet than a flute. A number of times, Mitsuhashi impressed me by playing a continuous note that rose or fell almost a full scale — an impressive feat for an instrument with only a small, “fixed” set of notes. I think I enjoyed the duets most of all. The instruments (and musicans) complimented each other well. On its own, the lonely, longing timbre of the shakuhachi threatened to overwhelm me with its sadness, but the sharp, epic, almost militaristic presence of the koto helped bring the sound back to earth and remind me that, whatever I was feeling inside, there was still a whole world out there to explore. For most of the audience, the Koto Concert would have been a breath of familiar air (or, perhaps to the second-generation Canadians, a possible answer to the question “Where did I come from?”) For me, my personal interest was piqued because it was foreign. This is not a side of Japanese culture I had previously discovered, and I was happy to have to opportunity to explore it. Koto concerts in Vancouver do not come along every day (or even every year), so I was happy to discover a new side of Japanese music. 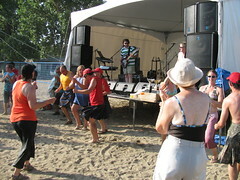 This entry was posted in Asian Canadian Cultural Events, Main Page, Multicultural events, Recent Reviews, Theatre on July 31, 2009 by Todd. 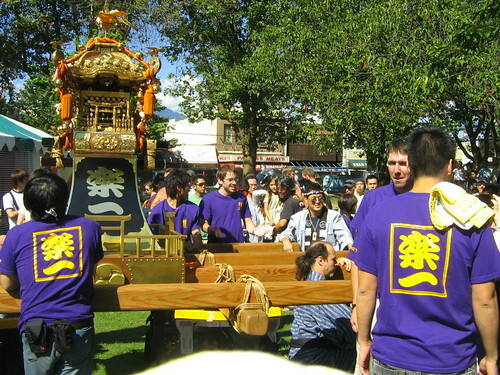 Gung Haggis Fat Choy dragon boat team at the start line for 5th Annual Vernon Dragon Boat Races. Steven Wong is steering our first race on Saturday. 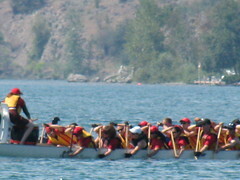 Vernon Dragon Boat Races are one of our favorite races of the year. We love the hot weather, lots of sun, the beach and the clean clear cooling water of Kalamalka Lake. This was our 4th visit to these waters. Our first race was a 200m sprint. We finished in 53 seconds…. and some of our stronger paddlers weren't even in the boat. I videoed the race on my camera. Video of 1st Race – 200m sprint. posted a 53 second 200m spint… and we were ready for the 500m. The winds picked up. Two other teams were already out on the water…. The race was post-poned. We were told to wait it out on land. But the wind started to blow all the tents away. We were told to go look after our stuff. We saw the band stand tent nearly getting blown off the stage. The races were being post-poned for about 40 minutes. into the lake with me – and we tried body surfing. Then the rain started…. Somebody said there was hail. 500m race would rescheduled for 9am first race of the day…. We have a picture of 13 people in the hot tub… as the sun was coming out. But we were already relaxed, and preparing our traditional bbq at Martin's Nest – childhood home of my girlfriend Deb Martin, former paddler/drummer/steers for the team.. Some of our paddlers went canoeing and kayaking…. at the private dock. Jane drums for the re-scheduled 500m race at 9am Sunday morning. We were in the first race heat on Sunday morning, rescheduled from Saturday afternoon. It was an easy 500m race. I (Todd) steered. I think we came 2nd. After we got off the boat, I was quickly pulled over to steer for another team, then another team. I had to take a break after being on the water for about an hour in the heat. B Final instead of A final. Because of our spin out, Gung Haggis was bumped to D Final instead of C Final. We had a good race final finishing 2nd with a time of 2:25. Then I (Todd) steered again for the Kelowna Blazing Saddles. The team had a strong race finishing 2nd, after catching up and passing a boat that had been neck and neck with us. Final time 2:16. “I Would Paddle 500 Miles!” – Kilts in front of the stage. Bruce from Calgary, Debbie from Kelown with Dave and Todd. more Gung Haggis paddlers on the right. Colleen, Alissa and Debbie show our 2nd place ribbons! Calgary Teams ruled the fastest times along with Kamloops' Extreme Currents, and Extreme Curves women's team. 1) Fastest 200m by GHFC at Vernon at 53 seconds. they were somehow involved in every other race. than bruised people and as a group we did well. This entry was posted in Dragon Boat photos 2003, Dragon boat with Todd Wong - Dragon Boat Coach, Gung Haggis dragon boat team information, Main Page on July 29, 2009 by Todd. 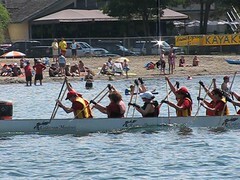 The Greater Vernon Dragon Boat Festival, is “THE FAVORITE” race of the Gung Haggis Fat Choy dragon boat team. This is the the 4th straight year we have entered, and the 5th annual race in 2009. 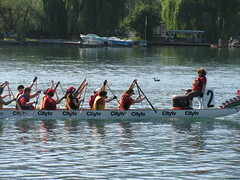 In 2007, the Gung Haggis dragon boat team won the gold medal in B Division. In 2008, we finished 2nd in the C Division Finals. We posted the 6th fastest time for 200m sprints this morning. Coach/paddler/steers Todd Wong, and paddlers Dave Samis and Steven Wong are also helping out to steer boats for other teams. high winds. The team waited out the wind and rain in the racer's village. But thunder and lightning storms continued the delay, until the races were canceled for the day. 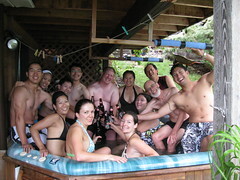 Choy dragon boat team retired to Martin's Nest, the home of our hosts, and 14 paddlers jumped in the hot tub. races on Sunday…. Team is in good spirits… and now doing bbq. 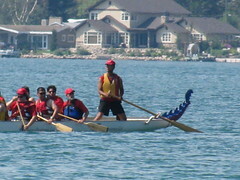 This entry was posted in Dragon Boat photos 2003, Dragon boat with Todd Wong - Dragon Boat Coach, Gung Haggis dragon boat team information, Main Page on July 26, 2009 by Todd. Team Canada featured the music soundtrack from The Wizard of Oz for its fireworks presentation on Wednesday July 22. Highlights for me featured different fireworks for each of the characters. The Scarecrow was a red curly-cue for a brain, The Tin Man for a heart, and a Medal for the Lion…. Also featured was one of my favorite classical music pieces: Night on Bald Mountain. See my friend VFK's photos. Tonight, Saturday July 25th, features South Africa. This entry was posted in Main Page on July 26, 2009 by Todd. 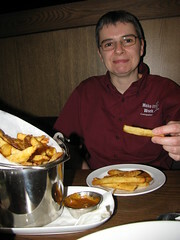 Chef Sam, of Foo's Ho Ho, passes on the the Great Kitchen in the Heavens. will also take place on Friday, July 31, 2009 from 6:30pm – 8:30pm. This entry was posted in Chinatown Vancouver, Food & Restaurants, Main Page, Vancouver Heritage and History on July 25, 2009 by Todd. 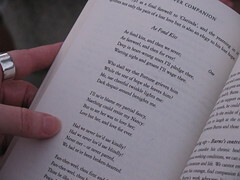 Recognizing the 213th anniversary of the death of Robert Burns: we read poetry! Rowing Club. Robert Barr told us how pipe bands and people gathered at the parking lot of the Bayshore Inn, and paraded down Georgia Street to the Stanley Park Entrance. A ceremony was held at the Robert Burns statue that had been erected 81 years ago August 25th, 1928. 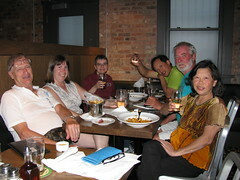 Gerard, Deb, Sarah, Todd, Ian and Keng enjoyed good company, good food and good drink. A toast to Rabbie! Ray the bartender at the Shebeen, looked after us verrrry well. 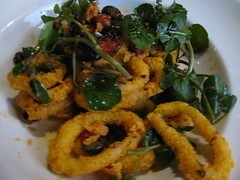 Batter fried squid with diced chorizo and sunflower sprouts. and the ceilidh after at the Rowing Club. mentorship in the ways of Burns dinners. This entry was posted in Main Page, Robert Burns & Burns poetry on July 22, 2009 by Todd. Anniversary of death of Robert Burns – July 21st. Pipers Allan and Trish McMordie at Robert Burns Statue in Stanley Park on the 250th anniversary of his birth, January 25th, 2009. 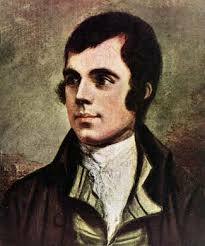 The 213th anniversary of Robert Burns death is July 21st. He was 37 years old in 1796. He is one of the world's greatest and most recited poets. He wrote about equality of the sexes, and equality of station for men the whole world over. 2009 is the 250th anniversary of his birth. I've decided NOT to organize a dinner at the rowing club. 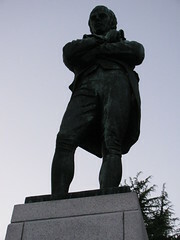 Then we will go toast Rabbie when the 9 o'clock gun goes off, at the statue in Stanley Park. We can read some poetry, tell some stories, and have a moment of silence…. Wear your kilt or tartan…. Flowers, pictures of virtual statue and wreath + glass of scotch, all left at Robert Burns statue on January 25th, 2009. 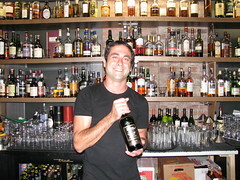 This entry was posted in Main Page, Robert Burns & Burns poetry on July 21, 2009 by Todd. Imagine comparisons between the poetry and songs of Robert Burns vs songs of Michael Jackson. Shall brothers be for a' that! 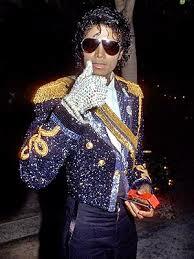 Michael Jackson was a fan of Robert Burns and once recorded an album of the Bard’s poetry set to music. The album plans were revealed by his friend, concert promoter and I’m a Celebrity… star David Gest, a year ago. Gest, once married to Liza Minnelli, told the Daily Telegraph the disc would give a modern twist to the work of the Bard. He said: “Our favourite poet in the world is Robbie Burns. Gest went on to reveal that he and Jackson shared a profound fondness for Burns, both greatly admiring his “brilliant mind”.